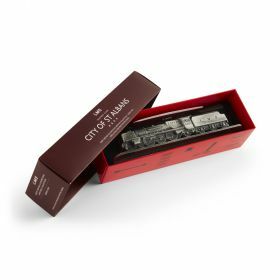 Hand-cast in the UK to high levels of detail, this limited edition, genuine pewter locomotive arrives in a stunning gift box with an informative leaflet. A collector's dream. Great British Locomotives Heritage Collection.Hand-cast in the UK to high levels of detail, this limited edition, genuine pewter locomotive arrives in a stunning gift box with an informative leaflet. A collector's dream.